"Nice Dress Nellie" walking in the Taylor's front door. Little is known about this charming lady. 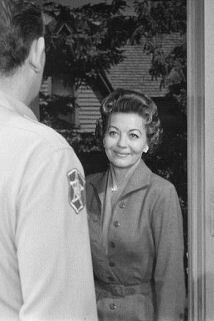 She has been referred to by fans a "Nice Dress Nellie" because in the episode that Barney arrests the whole town, "Andy Saves Barney's Morale" as she is released from jail with the crowd, Andy acknowleges her and comments "Nice Dress, Nellie" Fans should recognize her face as she appears as a background actress in over 30 episodes from first season, all the way to the last. Trained Noticers believe that her voice is heard in Episode 92, "A Wife for Andy" This picture is from that show as she arrives with the other ladies. As she is leaving the second time, one of the ladies says something like "I wonder what this is about" and she says "I wish I knew" She is always wearing a dress, often has on white earrings. In the color episodes such as "Only a Rose" (when she is a judge) you can see a few streaks of gray in her hair. Watch for her. She's everywhere! Just like Mr. Schwamp and Tom Jacobs. This page was last edited on 8 January 2017, at 03:29.